Oh man, the ending of Burn for Burn! I knew it was the first in a trilogy, but didn't anticipate how much I'd want to read the next installment in this series. 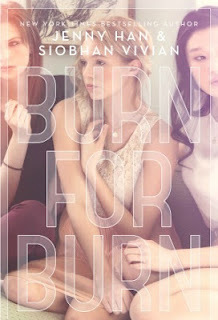 I should have known better; I love everything that both Jenny Han and Siobhan Vivian have written. A novel written by the pair could only be twice the fun. While the hallmarks of each author remain (a beach setting from Han and feminist messages from Vivian), the story is seamless and engrossing. Lillia, Mary, and Kat are three very different high school students who all desire revenge. Their pasts haunt them and they can only get their vengeance with each other's help...after all, who would suspect a teen queen, a rebel, and a shy new girl would be working together to take down Jar Island High's most popular students? With shades of The Craft, Carrie, and even The Breakfast Club, this novel features so many qualities that keep me turning the pages. The girls' revenge feels justified because the bad characters in Burn for Burn are genuinely evil. It's always good when the reader wants to someone to be taken down, even better when there are multiple characters who need to be taught a lesson. I look forward to a day when I don't feel the need to point this out, but an Asian protagonist (who is featured on the cover) is always welcome. This is the book that everyone will be clamoring to read, and then tapping their feet impatiently for the rest of the trilogy. Hmm, I might have to read this now! Great review!